This November, the Warwick Prize for Women in Translation was awarded for the first time. 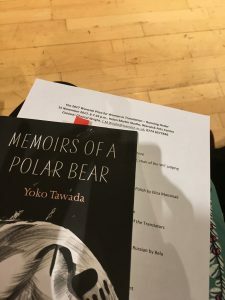 Katy Derbyshire attended the ceremony and wrote this piece for the Literary Field Kaleidoscope. It was a long time coming. Translators in particular started noticing the gender imbalance in published translations, awards listings and review coverage years ago now, and began thinking in earnest about how to change it in 2014. One idea was to initiate a prize, analogue to the Bailey’s Prize, for translated writing by women. A small group of activists met and talked with people and institutions in London, compiled statistics for the UK, initiated lists of untranslated titles (link to one of these lists on the literary hub website), contacted possible sponsors, sent out feelers every which way – all the while talking up the international female-authored books we love, especially during #WomenInTranslationMonth (August), initiated by Meytal Radzinski (link to an interview with her). What we wanted to do was find positive ways to highlight the imbalance, and also to showcase the excellent women’s writing that does make it into English. The UK (like the US) is not exactly a net importer of literature in the first place, but of the estimated 4% of published fiction that comes from other languages, only about a quarter was written by women. A literary prize honouring both writer and translator seemed like a great idea – it would get people to sit up and notice these great books that had won out against all odds, only to be sadly neglected by critics. And the people at Warwick University agreed. The university has a strong creative writing tradition (awarding the Warwick Prize for Writing biennially) and a lively translation studies department. The faculty boasts outstanding literary translators Maureen Freely, Rosalind Harvey, Michael Hulse and Chantal Wright – so Warwick is indeed a great home for such a prize. Fifty-eight books were submitted by publishers, more than the judges had expected – to widen the pool of eligible titles and show off women writers’ diverse talents, short story collections, children’s books, poetry and literary non-fiction were all applicable, as long as they were published in the UK or Ireland within the relevant period. The shortlist reflected that diversity, featuring a poetry collection translated from Irish, a Polish children’s adventure, Nobel laureate Svetlana Alexievich, a German short story collection, and two novels translated from Polish and German. Finally, on 15 November 2017, the day of the inaugural award came. Translators, academics, writers and publishers honed in on Warwick from Birmingham, London, Liverpool, Dublin and Berlin, filling the space at the Warwick Arts Centre and sipping really quite drinkable wine. Organizer Chantal Wright did us all proud. The warm, celebratory evening featured readings from all the shortlisted titles in English with shorts snatches of the original languages – no mean logistical feat. Chantal read statements by the judges and the translators on each book, sharing their admiration for the nominated women’s writerly achievements. 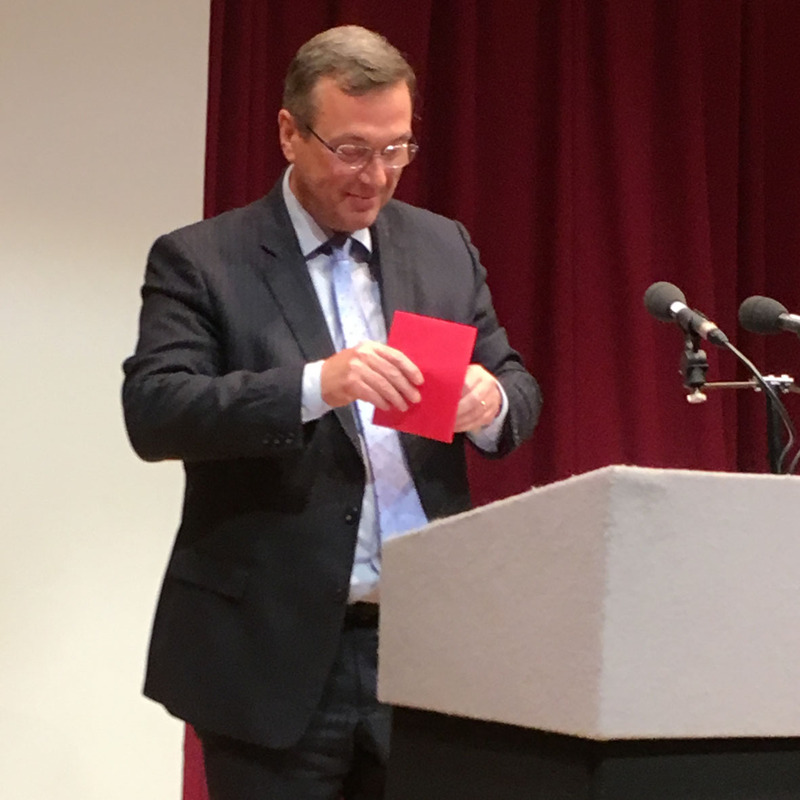 Judges Amanda Hopkinson and Susan Bassnett had words of thanks and praise to add, and the final announcement was made by Warwick’s vice-chancellor Stuart Croft. 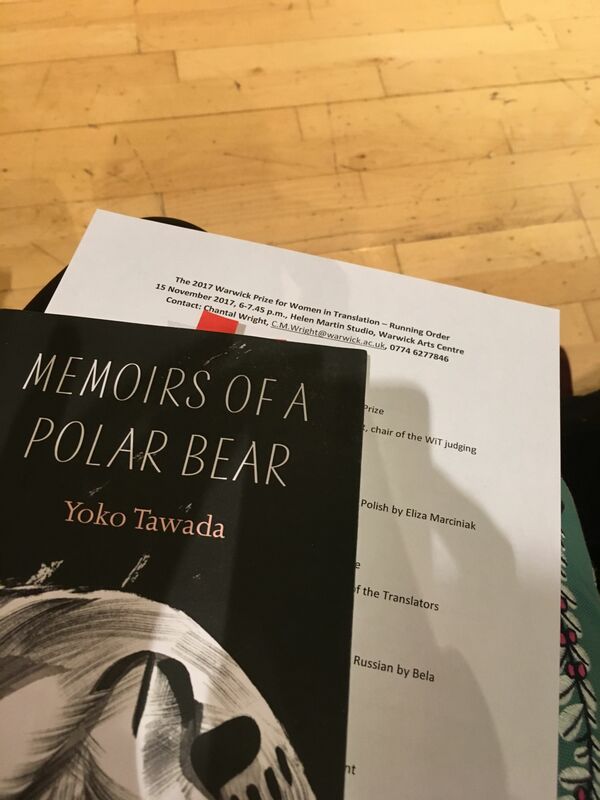 The winning book was Memoirs of a Polar Bear (link to the book on the publisher’s website), written by Yoko Tawada and translated from German by Susan Bernofsky. The judges called it: “an unusual book, funny and sad at the same time, personal and yet very political. Human society has rarely been described with such acuity nor seemed so strangely wayward. Magical fantasy collides with brutish political demagoguery. Susan Bernofsky’s deft and delightful translation revels in the disorienting wit and unsettling perspectives of Tawada’s furry stars.” The furry stars in question are three generations of polar bears, including Berlin’s own Knut. Tawada and Bernofsky share the thousand-pound prize, plus the eternal glory of being its first winners. Their editor at Portobello Books, Ka Bradley, received flowers and hugs on their behalf. The other piece of great news announced is that the prize will continue in 2018. Warwick is looking for a commercial sponsor so they can boost the prize money, pay the judges and maybe beef up the PR. Not that anyone’s complaining about the state of play after the almost ecstatic award ceremony. Pats on backs all round – to Rachel McNicholl and Joanna Walsh for initiating the project along with me at the grass-roots stage, to all the excellent nominated women writers and their translators, to the judges for reading, reading, reading and picking a humdinger – but especially to Chantal Wright for all her hard work. I hope she was as delighted as we were with the outcome. Dead Ladies – Very Much Alive!